For 4-H members and spectators alike, livestock shows are one of the most anticipated parts of a fair. 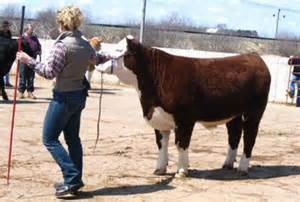 Preparing your animal for a show begins months in advance. Great care is needed in feeding your animal, practicing showmanship, and making sure your animal is healthy. After all the time and effort that goes into raising your animal, you want to make sure that you have everything you need once you arrive at the fairgrounds. Angel Granger, the 4-H Agent in Jackson County (also a former livestock club leader and 4-Her) suggests investing in a show box or rubber tote to keep all of your show supplies together. General supplies- water hose, spray nozzle, rubber boots, extension cord, extra rope, pitch fork, square point shovel, rake, and wheel barrow. Depending on the time of year, a fan is also a good idea (the temperature tends to change quickly in the fall and spring and can be unpredictable). Also pack a sign or poster about your animal (breed, age, name, sponsor, etc). General animal first-aid kit. Antibiotic cream/salve, aspirin boluses and balling gun, blood stop powder, and bleach. It is a good idea to disinfect the sand before you place your animal on the ring. A simple bleach mixture of 1 part bleach to 4 parts water, in a spray bottle will do. Show equipment. Show stick, show halter/lead, tie out halter and lead ropes. General animal first aid kit. Show equipment- most dog shows require a leash. Show clothes. There is no uniform for 4-H, but you will want to dress neatly and modestly. A button down shirt and dark pants are appropriate. A neck tie or 4-H bolero tie is a nice touch. Make sure your hair is neatly styled and pulled back away from your face. You may also want to bring some safety pins for your exhibitor tag. Human first aid kit- you can purchase one for less than $10.00, or put one together yourself (band aids, antibiotic ointment, pain reliever). Paperwork: A copy of the registration form you mailed/submitted, your animal’s health papers, your lease document (if applicable), and your ORIGINAL breed registry papers. Photocopies will not be accepted at check-in. It is a great idea to put these papers in a three-ring binder inside sheet protectors. Your knowledge and good sportsmanship! Be familiar with your animal so that you are prepared to answer any questions the judge may ask. Look over your feed record and record book. Remember to both win and lose gracefully. Be sure to label your items with your name. Consider laminating your packing list and keeping it in your show box with a dry-erase marker. That way, you can check the items off as you load them into your box or trailer. Being prepared will help you be less nervous and make your experience much more enjoyable. See you at the fair! 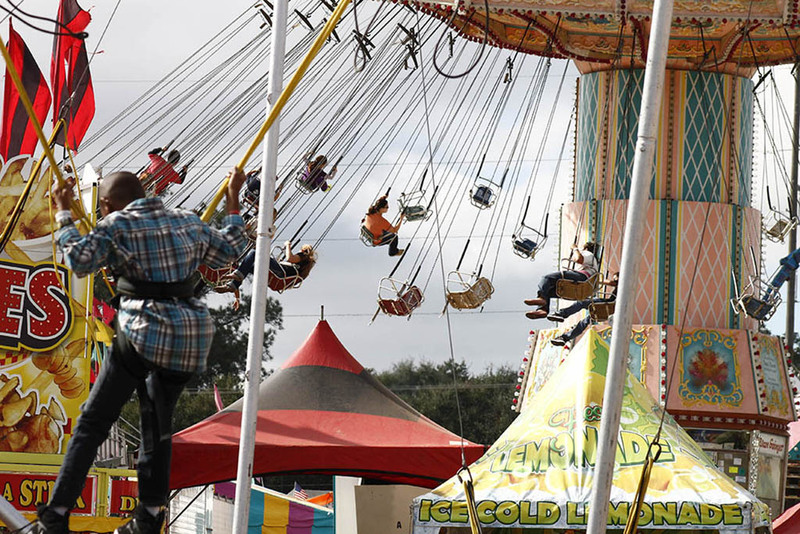 Fairs are often the highlight of the 4-H year. From a youth development perspective, fairs provide an opportunity for 4-H members to demonstrate new knowledge, abilities, skills and attitudes. When youth, parents and volunteers work together, fairs are a great way for youth to learn and also be recognized for their efforts. Being properly prepared is key to having a great fair experience. Youth Responsibilities- Establish a realistic timeline to work on your exhibits. 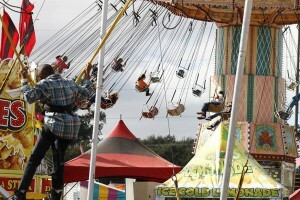 Be sure to read the rules and regulations outlined in the 4-H section of the fair book. Pay close attention to deadlines and specific requirements for each project. Make sure that your exhibit is your own work. Exhibits should be in good condition, clean, and labeled with your name, county, and club. Judging score sheets for individual projects can help guide you as you prepare your exhibit. Parent Responsibilities- Parents can help 4-H members obtain the materials and resources needed to complete 4-H projects, but should never do the project for the youth. Encourage your child to set realistic timelines and goals so that they do not miss entry deadlines. Help them complete their entry form. Many counties offer workshops or clinics in the weeks leading up to fair to help members prepare- take advantage of these sessions! Volunteer Responsibilities- Share information about fair exhibit categories and deadlines with your 4-H parents. Project leaders are a great resource to help members decide what to exhibit about their project. It could be something they made, or it could be a poster or tabletop display about what they have learned. If possible, assign an older, more experienced member to mentor new members as they prepare. Consider having a mock judging of exhibits so that any last minute adjustments can be made. Invite parents to attend along with the members and use this meeting as an opportunity to provide feedback and recognition to individual members and to promote club unity and pride. 4-H members are encouraged to try something more challenging each year and to practice good sportsmanship. Exhibiting is designed to be an enjoyable educational experience not just a contest. If you would like to help 4-Hers in your county get ready for the fair, or serve as a judge for your fair, contact your local county Extension Office. Local county agents are working hard to set up at the Sunbelt Ag Expo. You can watch our live feed below! 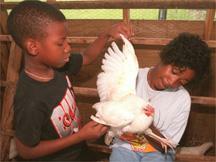 4-H National Youth Science Day (NYSD) is a great opportunity to engage youth in 4-H Science. Each year, National 4-H Council announces a National 4-H Science Experiment. NYSD is October 8th, but the experiment can be conducted anytime. This year, youth will be tasked with the same mission: in light of the recent natural disasters such as Typhoon Haiyan, National 4-H Council is asking youth to design and build an aerodynamic food transportation device that can deliver a payload of nutritious food to disaster victims. Youth will learn engineering concepts, develop math skills, learn about nutrition and help solve a relevant, global issue. You can purchase a pre-made experiment kit from the 4-H Mall, or you can make your own for less than $10.00. All of the supplies can be found at your local hardware or big box store. A “how-to” video shows you how to set up and facilitate the experiment. A word of caution- the video shows youth jumping onto the launcher with both feet- this weakens your launcher and could cause youth to lose their balance. We recommend that youth only stomp on the bottle with one foot. Experiment guides for volunteers and youth can be found online for free. If you register your event online, you will get access to three more activities that you can do with your kit. For teachers who lead in-school or afterschool 4-H clubs, this experiment achieves many of the common core science standards There are several contests and prizes for clubs, teachers, and youth. Many of these contests offer cash prizes or gift cards. To find out more, visit the NYSD website. We would love to know how you and your youth benefited from this program. Please complete the evaluation for volunteers, and share the link for the evaluation for youth with your club members. How do you plan on celebrating NYSD this year? Share your photos and ideas on our District Facebook and Twitter! Also, make plans to join us on October 20th for Make a Difference Monday at 7/6 central. 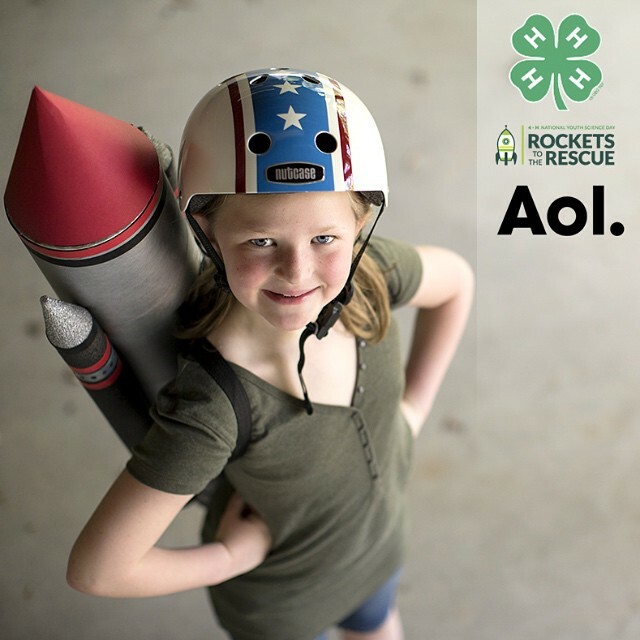 Dr. Dale Pracht will be sharing how to create safe environments in our 4-H clubs. If you cannot make our live presentation, it will be archived along with this month’s presentation at http://florida4h.org/madmondays. 4-H Meetings should be fun for both the members and the volunteers. Club environments that cultivate belonging, mastery, independence, and generosity. Leading a 4-H club should be a fun and rewarding experience. Earlier this month, during our Make a Difference Monday Volunteer Leader Series, Tycee Prevatt shared some simple, but creative ideas to make club meetings fun, but also more manageable! Divide your club into teams of 3-5 youth. Assign an older 4-Her (intermediate or teen) to serve as the team leader. This will not only make your club more manageable, but it also fosters leadership, teamwork, and cooperation- three essential skills for a happy and productive life. Assign each team a color (buy inexpensive plastic tablecloths at the dollar store in each team color). Teams sit together during club meetings/functions. Parents sit behind the teams so as not to interfere. Teams can earn points for: attendance, being prepared for club meetings, being on time, doing a club demonstration, participating in a club service project, and attending 4-H events and activities beyond the club level (such as a day camp or canning workshop). As the leader, you can also use “pop quizzes” or project skill a thons to allow more opportunities to collect points. Parent can help with the skill a thon stations and your 4-H agent can help you set up a skill a thon. Stations can be project specific, such as naming the parts of a saddle, or they can be more general, such as reciting the 4-H pledge from memory or answering 4-H trivia questions. It is important to set up a points system before introducing this to the club. This idea is really easy to adapt to any club situation. This example of a club points system is from a livestock club. You will also need to decide on appropriate incentives. Some clubs give out a grand prize to the top team, others give prizes for 1st, 2nd, and 3rd teams. Ideas include: partial scholarships to 4-H camp, cash award, pizza or bowling party, or a fun field trip related to their project. Your club may need to do some fundraising to help pay for the prizes. The team approach works well because it really encourages the members to attend the meetings on time and prepared. It helps motivate them to become more engaged. You will also have fewer interruptions or discipline issues, because teams can lose points for that! This approach works particularly well for medium to large clubs and can even be adapted for use during camp. What are your best tips for making meetings fun? Let us know in the comment box below. Also, make plans to join us on October 20th for Make a Difference Monday at 7/6 central. Dr. Dale Pracht will be sharing how to create safe environments in our 4-H clubs. If you cannot make our live presentation, it will be archived along with this month’s presentation at http://florida4h.org/madmondays.